Sinningia schiffneri comes in at least two forms, one with darker foliage and more spots (pictured). This includes only three species, out on the fringes of the sinningia alliance. S. gerdtiana has white flowers with a dramatic network of purple lines. S. schiffneri is a shrub that sends up multiple shoots from its base, much like Raphiocarpus petelotii. Its flowers are small and white with purple spots. Paliavana plumerioides is a difficult plant, likely with bat-pollinated flowers. 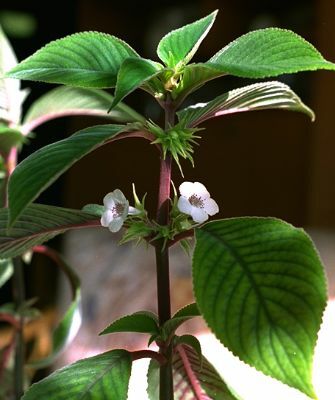 It drops its leaves before blooming at the top of bare stems. The two sinningias in this group have been hybridized with other sinningias, proving they are closely enough related to form hybrids but not closely enough related to form fertile hybrids.